You’re a busy appliance-store-and-repair-shop owner, and you’re about to hire two new technicians. You’d prefer that both had experience in appliance repair, but, occasionally, you like to take on someone with drive and ambition and a willingness to provide outstanding service to your customers. The missing piece is that person usually has little knowledge of appliance repair, and, of course, zero experience. Do you take a chance? If you do, how do you get the person up-to-speed and ready to go on service calls, sooner rather than later? You do take a chance! His name is Jeremy in this scenario. The twentysomething reminds you of you back in the day when you started repairing appliances. You loved the work almost right away. Your employer took you out on calls, you watched what he did, and, in time, got hands-on experience under your employer’s watchful eye. You also saw how he interacted with customers. Two months later, you were ready to handle the less-problematic calls. Your repairs were top-notch, though, and customers liked and requested you for future calls. By the time you decided to go out on your own three years later, your employer slapped you on the back, shook your hand, and provided you with excellent references you would use in advertising your new repair shop. You and wife Margo established yourselves in a new community and soon bought a larger building where you added appliance sales. You sold refrigerators, dishwashers, washers, dryers, stoves, and microwaves. Sales took off, thanks to a knowledgeable sales team – and you repaired every appliance you sold, as well as some you didn’t sell. When you hired Jeremy, you were impressed by his excellent references. His work record and work ethic were breathtakingly similar to yours. Jeremy wanted to succeed. He’d only left his last employer because he wanted opportunities beyond what the employer could offer. You knew Jeremy needed ground-up training. You also knew you didn’t want him to lose his drive and ambition by training him the slow way, the way you had been trained. Training. The key to Jeremy’s — and your — success. Despite your employer’s best efforts, you didn’t have all the training and knowledge you needed, so you took short-term courses at your local community college. You never missed an opportunity to learn more. You knew instinctively that Jeremy would be a lot like you. You and Margo discussed best training options for Jeremy. In today’s marketplace, there is even more to learn, and it would take a long time to teach your new employee. Beyond showing Jeremy the basics and your business’s system, you knew his trainer wouldn’t be you. Time was one factor. Besides your own repair workload, you kept a firm hand on everything that happened in your business, and you also cut radio ads that Margo writes. Years back, she had convinced you that, with your fun personality and ability to get across your message, you should be the on-air personality for this business. Hands-on training by instructors who are, or had been, repair technicians themselves. Knowledge about electricity. After all, it’s what operates every appliance you sell and service. Training on the major brands and types of appliances you carry. Over a pot of coffee, you and Margo reviewed her top find. 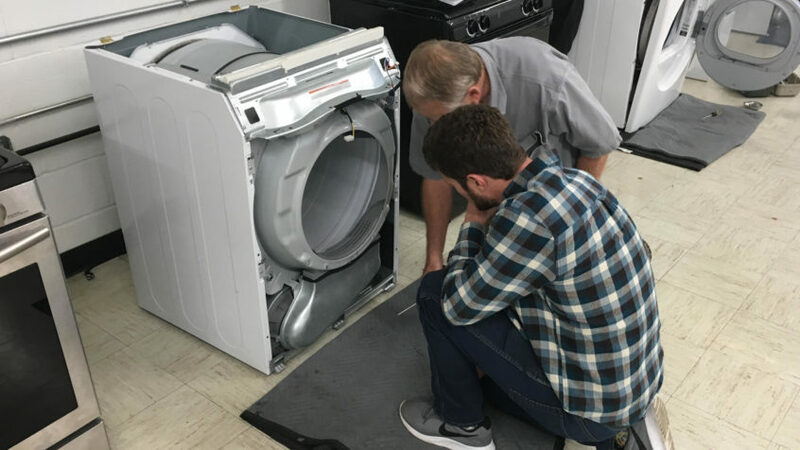 The course at Fred’s Appliance Academy you liked best was Basic Appliance Repair, a three-week comprehensive course, ending with the student earning three certifications when all 120 hours of coursework had been satisfactorily completed and any tests passed. The Academy met all three of your basic requirements for a study program for Jeremy. Student housing and private bedrooms are part of the tuition. So Jeremy and other students spend their time right there on campus, concentrating on your course material. He’ll learn how to repair all the appliance types that you sell and service. Important! He’ll learn how to read wiring schematics, how to use a voltmeter – necessary for repair work. He’ll also learn how to research information about various brands that he’ll work on, and how to find correct parts for the customer’s appliance, knowledge he’ll take with him back to your shop. The Academy maintains an inventory of over 200 appliances students will use for hands-on experience. Students come from all over the U.S.
Jeremy will leave this course with a certificate of completion from the Academy, as well as a certificate for NASTeC Certification after testing; an Appliance Service Fundamentals Certificate after testing. You and Margo are excited about Jeremy’s future and knew that if he eventually decides to go out on his own, he’ll have the knowledge and experience to succeed, just as you have. When you lay out the training program plan to Jeremy, he’s excited, too. As soon as you enroll him in the Basic Appliance Repair course and pay the tuition, his next important step will be heading to Fred’s Appliance Academy in Northern Ohio. If you’re an appliance repair shop owner and you’re not certain how you can best train your new, inexperienced employee, contact us today. Together, we’ll put that uncertainty to rest.